Looking for Yield? Try Technology Stocks. 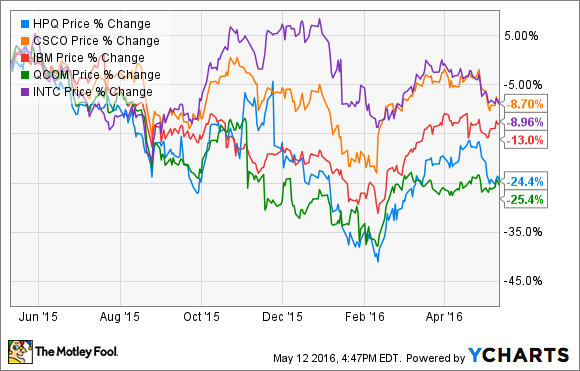 Many big-name technology stocks are becoming very attractive for dividend seekers. The investing landscape has changed quite a bit for dividend investors. Those seeking high yields in equities had to traditionally invest in the financial, utilities, telecom, and consumer-staples sectors. Today, investors can also find attractive yields in an industry traditionally devoid of dividend payers -- technology. According to CNBC, by the end of 2003, only 22 information-technology stocks paid a dividend. Today, that list is up to 185. Of those companies, 87 are yielding at least 2.17%, the current dividend yield of the S&P 500. Some of the more popular names are paying out well over 3%. These are five technology stocks paying a dividend higher than Johnson & Johnson, Procter & Gamble, and ExxonMobil. However, not all dividends are created equal. There are two ways the dividend yield can increase: when a company raises its dividend or the stock price declines. With the exception of HP, the five aforementioned tech stocks all have raised their dividend over the past five years. However, over the past year, these stocks have struggled to provide positive returns. Even Apple (NASDAQ:AAPL), a company that now pays out a 2.5% dividend, has declined 28% over the past year. Traditionally, technology has been a sector where investors go to find growth. To innovate, pay top talent, and chase new markets, the earnings of IT companies have been retained rather than paid to shareholders. When a company transitions to paying a dividend, it's often a signal to investors that the company has ran out of ways to earn outsize returns for investors. As a result, many of these tech stocks lose a certain class of investors. Dividend seekers, on the other hand, would much rather receive a 3% yield on a company that sells cereal, shampoo, or oil than software and peripherals. With growth and value investors both shunning high-yielding tech stocks, one can see how these companies struggle to provide investors with gains. During the growth phase of their business cycle, many of the now technology stalwarts were able to command high margins for an extended period. As a result, some of these companies developed huge cash hoards. Apple and Microsoft (NASDAQ:MSFT), for example, respectively have $55 billion and $97 billion of cash and equivalents on hand. Cisco and Intel have over $60 billion and $15 billion, respectively. In addition to having a large cash balance, many of these companies are generating cash at a rate that allow them to both pay a dividend and reinvest in the business. In a low-interest rate environment, it's very difficult to find yield. As a result, the price of traditional dividend stocks has been driven up. However, some of the big-name technology companies haven't enjoyed the same run-up. By focusing on dividend-paying tech names that have a reliable cash stream, strong balance sheets, and room to grow their payouts, investors may be able to find potential for both growth and income. However, the technology sector is not like utilities and consumer staples. Investors should beware of value traps and stay away from companies that are no longer able to innovate or keep up with the competition.